Sandra Mitcheson has sent me information about her great grandfather’s brother, John NOONAN. John was born in Cheshire, Stalybridge in 1868 of Irish parents. He and his siblings attended St Peter's RC School in Stalybridge. The log books show that John stayed on, along with another pupil - Joseph PLATT - who later became a Headmaster. "Considering the character of the boys with whom Mr McSHACKLEY has to deal, the results of his inspection may be regarded as excellent." Another very similar Summary Report, this time describing the two as pupil teachers. PTs Joseph PLATT & John NOONAN complete their APPRENTICESHIPS today. On Thursday examined all the Standards in their different subjects with very satisfactory results. All the teachers very attentive to their duties as regards their classes. School re-opens after Midsummer holidays. John and Annie married at St Oswald's Catholic Chapel at Ashton in Makerfield. I believe that John was a teacher at Our Lady Immaculate at Everton Elementary School for most of his working life. Annie NOONAN is listed as a teacher in 1901. In 1891, John, Annie and their first child are listed at 225 Breckfield Rd North - the address given in the 1894 Directory for Liverpool. In 1901, their address is given as 130 Beacon Lane, Everton. By 1911 they are back at 226 Breckfield Rd North. John and Annie’s oldest daughter, Mary Josephine also became a teacher - in 1911 she is listed as teaching at an Industrial School - possibly St George’s Industrial School which was in Everton Rd. There were a few Catholic Industrial schools at the time. His daughter Margaret may also have become a teacher. John seems to have taught at Our Lady Immaculate for years. There he taught Richard Downey (future Archbishop) as a child. According to the Biography of Richard Downey b 5 May 1881 at Kilkenny, son of Thomas & Mary Downey nee Casey, grew up on Calder St Everton. However.....this is puzzling, as Sandra cannot find Richard Downey on the 1891 Census when he would be 9yrs old!! In 1901 Census Richard Downey 19 is a Student at St Edward's College at Everton. We have to assume, therefore, that John was teaching here some years earlier (he is consistently listed as a teacher at Elementary Schools). 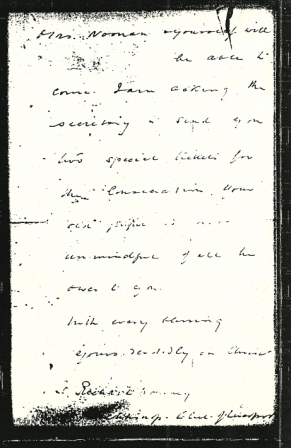 Sandra has a personal letter from Bishop elect of Liverpool Richard Downey, dated 12 Sept 1928 inviting John Noonan & his wife to his Consecration as Bishop. He goes on to say: "your old pupil is not unmindful of all he owes to you". 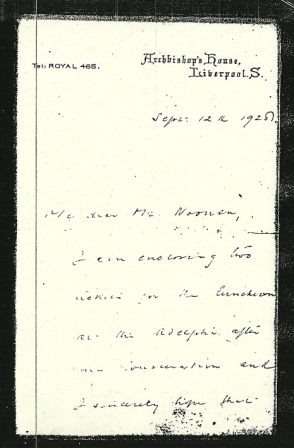 John Noonan's Obituary in 1942 says he retired from the Headship of Our Lady Immaculate in 1932. He must have been headteacher there for a good while. We’re now looking for some more information about John and his family.